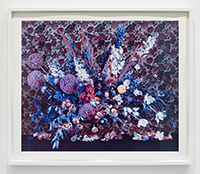 In a radical break from her earlier, technically sophisticated photographs of vibrantly colored cubes, the Canadian artist shows a series of gorgeously gaudy floral still-lifes. If Josef Albers was a key influence on her previous work, the model here would seem to be Paul Outerbridge, who masterfully merged naturalism and artifice. Using an exacting, all but obsolete color process not unlike Outerbridge’s, Eaton has produced ten variations on the same flower arrangement, shot against rose-patterned wallpaper. Only one of those pictures appears true to life; the rest skew brown, blue, red, or psychedelic pastel. Considered together, they subvert the conventions of realism to brilliant effect. Through May 23.